Concert hall, built by Arthur Erickson and Mathers and Haldenby. Opened 14 Jan 1982. Named in honour of Candian newspaper propietor Roy Thomson (1894-1976) after a gift from his family. 2002 renovations. 2630 seats. Home to the Toronto Symphony Orchestra and Toronto Mendelssohn Choir. 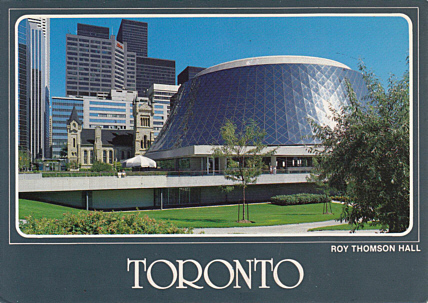 Front Text: "Toronto", "Roy Thomson Hall"
Reverse Text: "Roy Thomson Hall. Toronto's outstanding concert hall is home to the Toronto Symphony and Toronto Mendelssohn Choir. Performers of international class appear in concert in thie magnificent hall. - La salle de concert éminente de Toronto abrite le Toronto Symphony et le Choeur Mendelssohn de Toronto. Des artistes de classe internationale donnent des concerts dans cette magnifique salle."